Dedicating early hours to primping is a nightmare for those of us who “snooze” until the last possible second. Jennifer Byrne, author of THE LAZY GIRL’S GUIDE TO LIFE, shares three hacks that will make you look like you just stepped out of your favorite makeup store, all in 10 minutes or less. So, one morning, you woke up and noticed your face looks like a Domino’s five-topping flaky crust special. You have black- heads, whiteheads, and possibly even redheads (they’re so feisty and tempestuous! ), oil slicks next to frown lines, and pores so huge you’re thinking you might be able to rent them out as apartments (no smoking, pets negotiable). And of course this is the day of your big job interview, your passport photo appointment, and—worst of all—your first date with that promising guy you met at your cousin’s wedding. It looks like all those nights of not bothering to wash your face before you went to bed have taken their toll, but all is not lost. You can x this. If makeup artists can manage to make Madonna not look like an ancient Komodo dragon, there’s absolutely hope for you. Note: These hacks work best if you do all of them consecutively, but they each work on their own as well . . . you know, in case getting through all three just seems like overdoing it. An important step to faking perfect skin is to apply a primer or a moisturizer. If your skin is not properly moisturized, the rest of your makeup is more likely to cake awkwardly around lines and other flaws, making them stand out even more. And while cake is pretty freaking amazing, there’s a time and a place for everything. So put on primer or moisturizer, wait a few seconds, and then apply your concealer. Goodbye lines, hello smooth skin! Concealer is definitely your friend, but think of it as being like that friend who drinks one too many rum-and-Cokes and then starts crying about her unrequited crush and singing Michael Bublé songs before passing out. Less is more. It’s best to choose a shade that’s one or two shades lighter than your foundation, which should match your skin exactly. Dab the concealer under your eyes, around your nose, and on any other spots that are red or discolored. Then pat it gently, blending it in so that the discolored areas look brighter. Although this brightening is awesome and you might be tempted to add a ton more, please resist. Try to respect the fact that many people have deep-seated fears of mimes and clowns. It’s time to talk foundation. The good thing is that you probably don’t need to apply foundation to your entire face, just the areas that need coverage. Your foundation shade should match your natural skin tone as closely as possible, so you don’t get those telltale lines of demarcation around your jawline. The foundation you use should be tailored to whether you have dry skin or oily skin. 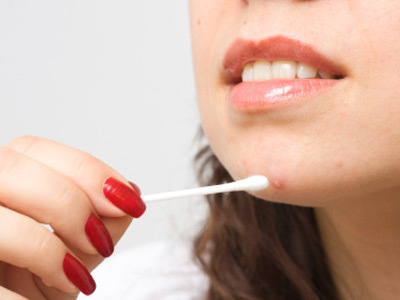 For those of us who suffer from the multiple personality disorder of skin, politely known as “combination skin,” the choice can be more confusing. For us, it is difficult to tell from day to day—even moment to moment—whether our skin belongs at the prom or the nursing home. Of course, you can try one of those “smart” foundations specially made for combination skin (if you’re wondering how they know where to moisturize and where to de-oil, it’s best not to think too hard about it). If this doesn’t work, you can keep two separate foundations for either situation, and decide each day if your skin is oilier or drier. Finally, brush on a light dusting of powder, like fairy dust, and check out the amazing magic you’ve conjured up. Wow! You look gorgeous, and your skin doesn’t resemble pizza or cake. I’d say that entitles you to a slice of each! Now that you’ve cut down your morning routine, have a good breakfast that’s designed to help you glow. This collection of humorous life hacks features 100 easy, low-commitment solutions to the everyday problems of the twenty-something woman.Do you have a lot to do but can’t seem to bring yourself to do it? 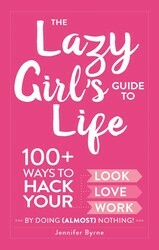 The Lazy Girl’s Guide to Life can teach you how to get things done with as little effort as possible. Learn to simplify your beauty routine, keep up with your friendships, hack the dating game, and get by in the corporate world with these easy, low-commitment suggestions. You’ll find over 100 solutions to your most common problems, including: -Smoothing out frosting on store-bought cupcakes so they look homemade -Hiding dirty dishes in a soapy sink before company arrives -Washing and styling bangs (only) to avoid the limp hair look -Faking it as a food blogger to snag a dinner reservation -Reading the plot summary online before a book club meeting With lazy girl–approved hacks that range from humorous advice to quick fixes, you’ll be able to find a temporary solution to simplify your life in no time!